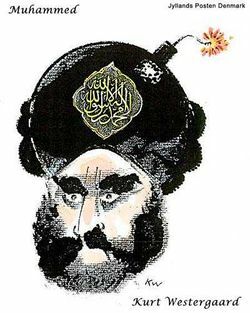 In September 2005 Jyllands-Posten, a Danish newspaper, published twelve cartoons of Muhammad, creating a flashpoint between the freedom of the press and Muslims objecting to the publication of the cartoons. Within six months, 139 people died and 823 people were injured by violence attributed to the controversy. Because of the twelve cartoons, Danish, Austrian, and Norwegian embassies were burned in Syria and Iran. Islamic leaders called for a boycott of Danish goods, and the cartoonists themselves were forced to go into hiding due to death threats made by Muslims. The images appeared on the blogs and in smaller independent newspapers, but most of the U.S. mainstream media refused to publish the images even as they covered the issue extensively. After these episodes, there were several cases of self-censorship out of fear of offending the Muslim community and sparking violent retaliations. In 2006 a German theater cancelled a play in which several characters, including Muhammad, were beheaded; in 2008 Random House decided not to publish The Jewel of Medina, a book about one of Muhammad's wives. In 2009, the German book publisher Droste Verlag canceled a novel about the barbaric practice of honor killing. On April 12, 2006, The television show South Park aired the episode "Cartoon Wars Part I", which challenged the Comedy Central network to let an image of Muhammad air uncensored in the next episode, "Cartoon Wars Part II". Comedy Central did, however, censor the image of Muhammad. It should be noted that Muhammad had been shown on South Park several times before, when there was no pre-existing controversy. In fact, he's in the show's opening. The show has a history of mocking religions, having also offended Christians, Jews, Muslims on other occasions, Buddhists, Scientologists, New Age religion and even Atheists. In fact there is still some debate about the claimed ban on images of Mohammed; many images exist in Muslim art, and the prohibition appears not to have been decreed until centuries after his life. Various interpretations of Islam also prohibit depictions of ALL prophets (including Jesus Christ) or ALL living creatures. The riotous response to the Danish cartoons was a very selective outpouring of anger, and did not take place until several months after their publication. On September 25, 2012, in his address to United Nations General Assembly, Barack Hussein Obama said that "The future must not belong to those who slander the prophet of Islam." This outrageous comment, yet another evidence that Barack Hussein Obama is almost certainly the first Muslim president of the United States, was predictably ignored by the lamestream media, but rightly highlighted by Conservative commentators.